Perudo – the class game of liar dice. Review and giveaway. When you hear Stephen Fry describe something as “the second most addictive thing to come out of South America” you’re going to sit up and listen aren’t you? That’s exactly how this national treasure described Perudo and it certainly made me sit up and wonder what all the fuss was about. Perudo (meaning Dice of the Andes) is described as “the classic game of liar dice” and it is very much a skilful game of guesswork, bluff and luck. The main aim of the game is to be the last player left with any dice, but how you get to that stage is a little more complicated. Let me start with a bit of history of the game and go back to 1532. Peru fell into the hands of foreign invaders with Pizzarro and his conquistadors defeated and held captive. It marked the end of the Inca empire, but also the rumoured start of the Perudo dice game. Supposedly Atahuallpa introduced Pizarro to Perudo during his imprisonment. Certainly today, the game is played throughout Spain and Peru. 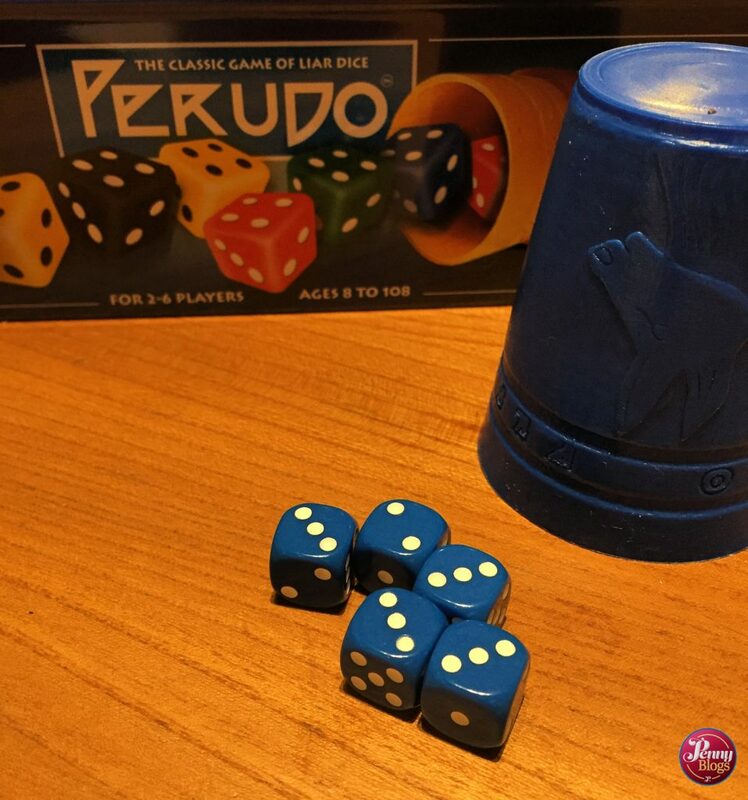 The winner in a game of Perudo is the last player to be left with any dice, each player starting the game with a cup and five dice of the same colour. Hmmmm. Now this is where things got a bit more complicated when Bonn and I were trying to play. The game isn’t actually that complicated, but you’d be forgiven for thinking it is the first time you read the rules! First things first. Each player rolls one die to determine who goes first. The one with the highest number does. Easy. Next. Each player puts all five dice in their coloured up and upends the cup on the table covering their dice from the other players. The first player takes a secret look at their own dice and then makes a “bid” which is an estimate of how many of a particular number there are under all the cups on the table. There are two main factors that they take into account when coming up with this bid. The total number of dice on the table. If you have six players then this is 30 dice. If only two of you are playing then there are just ten dice. There is a one in six probability of each die showing a particular side. 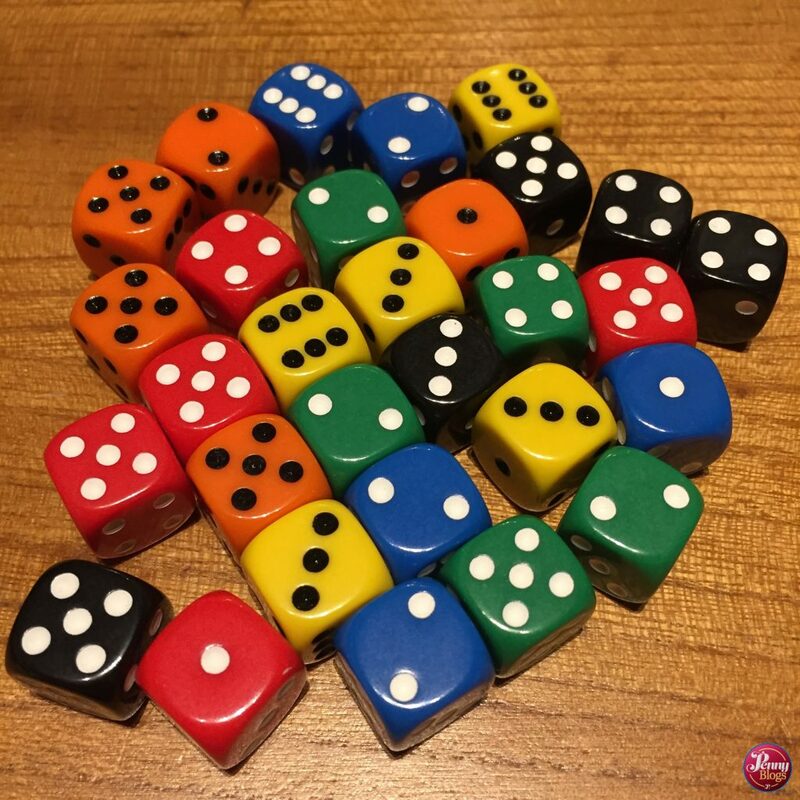 So, if the example of there being six players you would generally expect there to be five of each number when you look at all dice on the table. The second thing that you need to take into account when coming up with the opening bid is ones on the dice – known as aces in Perudo. Like they might in a game of cards, aces are classed as wild and counted as the value of whichever bid is made. So, for example if you were to make a bid of eight fives then it means that you are predicting a total of eight dice on the table that have either a value of five or one. Once the opening bid has been made play moves around the table in a clockwise fashion. The next player makes a bid, that has to be higher than the last one. Either in terms of the number of dice of the same number, or a higher number of dice showing a different number. If a player feels that there can’t possibly be a higher bid made then they shout out “dudo” instead, which means “I doubt” in Spanish. This effectively halts the bidding stage and it means that the previous player’s bid stands. Once dudo has been called then dice on the table are revealed, player by player, starting with the one who called dudo and continuing around the table until reaching the player who made the final bid. The number of dice of the particular value in the bid are counted, along with the number of aces. If the final bid was seven threes and there are fewer than seven dice showing either three or one, then the player who made the last bid loses one of their dice. If there are seven or more threes or ones in total, then the player who called dudo instead loses a die. Lost dice are placed into the bag so that the total number of dice in play is obscured, so players need to try to remember when making their opening bid. The player who loses a die makes the opening bid in the next round of the game. Without explaining every last rule in detail here, it is worth saying that there are other twists in play. One of these is that part way through the bidding you can change what you are bidding on from a number on the dice to aces. There are rules around how you do so that can be a bit confusing until you actually do it in practice. When any player is down to just having one die left in their cup they are declared palafico, which means that the bidding rules in that round are changed slightly so that players can only raise the quantity of dice, not the value in the bids as they go around the table. Aces are also not wild during such a round. To add to the complexity even more, a player can only be palafico once in a game of Perudo, yet once they have been palafico they have more rights in a round where another player is palafico. I hope you’re following this! I won’t lie, Bonn and I felt slightly nervous when we sat down to try and play Perudo for the first time after reading all the rules. There seemed to be so much to take in and remember. We got started though with the two of us walking our way through a two player game and learnt as we went on. At first it did feel a little clunky as we kept stopping to look up in the instructions book as to how we were supposed to do things, but with more rounds we became more confident in what we were doing, and also learnt more about how to bluff better to try to catch the other one out. As is the case with many games, I’m expecting Perudo to feel very, very different if you had more people playing. My kids are a bit too young to be trying it yet, so we’re waiting my step-daughter’s next visit to test it out properly with three players. We’re also slightly dreading my mum playing with us – as previous experience playing cards with her suggests she might be a bit of a Perudo demon! I can totally see why Perudo is a bit of an addictive game. I’ve not played any dice games before, but playing felt quite similar to card games in may ways and playing against people that you don’t know I expect has a very different vibe to it. Every year Paul Lamond host the Perudo Championships in London, where fans of the game are able to battle it out to be crowned World Perudo Champion. I can’t imagine that my skills in the game are anywhere near enough to take part yet, but I am intrigued to watch and see how others play. Perudo is for 2-6 players and has a suggested age range from 8 to 108! It comes in a very neat storage tin, making it a lovely game to give as a gift to someone. It has an RRP of £19.99 and is available in store in Sainsbury’s, Debenhams and John Lewis, as well as being online here. 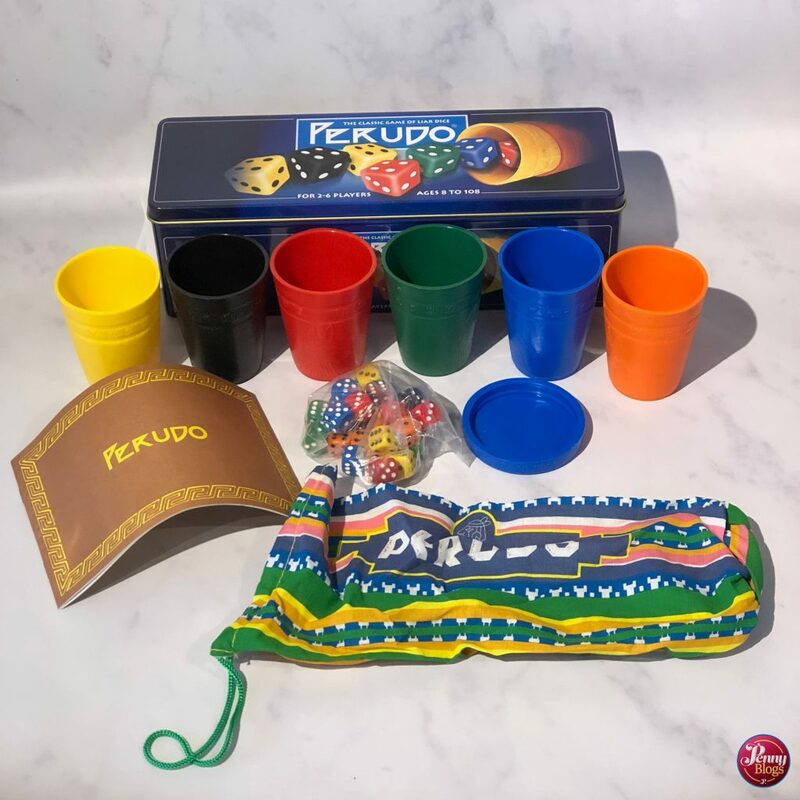 Do you want to have a go at playing Perudo yourself? We’ve got a copy of the game to give away to one lucky Penny Player reader. 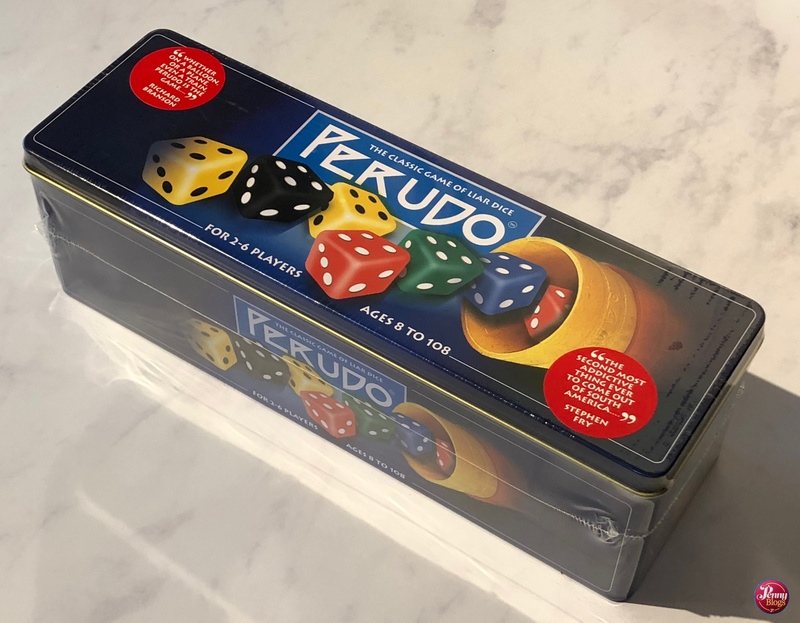 Perudo has a lot of famous fans (Stephen Fry, Hugh Laurie and Richard Branson for starters) so all you need to do is leave a comment below telling me who (famous or not) you’d like to play Perudo with. Then fill in the Rafflecopter widget, looking at what you can do to get extra entries, and one person will be chosen at random to win a copy of Perudo. For full T&Cs please see the Rafflecopter widget. Disclaimer: We were sent a copy of Perudo for the purposes of this review. All opinions remain my own. This post contains affiliate links.